Excel High School is Recognized by the Virginia Department of Education as an accredited, State-approved high school. 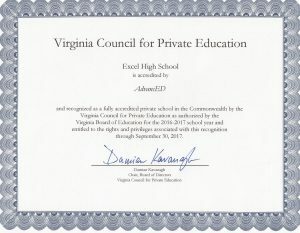 Excel High School has completed the registration process with the Virginia Council for Private Education, which is the agency charged with oversite for Virginia private/non-public, accredited high schools. Excel High School currently serves students in the Commonwealth of Virginia and in all 50 States in the US. Excel High School is further expanding its national reach by providing Regionally accredited, online high school options, for more students within the State of Virginia. Excel’s credited are accepted by all VA high schools. Furthermore, Excel’s high school diploma is recognized by all Virginia colleges and universities. Excel High School is Regionally accredited by AdvancED NCA, SACS and the NWAC, which accreditation is recognized by the State of Virginia and the US Department of Education. In 2012, there were almost 8,000 high school dropouts in the Commonwealth. Excel plans to work hard to help to reduce this number of dropouts, by providing convenient and affordable high school graduation opportunities. Excel works with Virginia schools, both public and private, as well as community colleges, State prisons and community organizations to provide online high school options for underserved populations. Students’ dropout of high school for many reasons including pregnancy, substance abuse problems, family crisis, situations of bullying or general lack of interest. Excel is teaming up with up with partners to help solve the dropout problem, both within the State of Virginia and throughout the US. Excel High School offers online high school options that specifically meet the diverse needs of students who need flexibility with their education. Online courses are self-paced and can be accessed anytime, anywhere with a high-speed Internet connection. Excel’s online high school courses are rigorous and fun and are based upon common core standards. The high school prides itself on offering a student-centered, nurturing approach to education, allowing students the opportunity to complete an accredited high school diploma entirely online. Excel has high school diploma options for both high school aged students and adults. The school charges a nominal monthly tuition fee that encompasses an all-inclusive program including, digital textbooks, lectures, lessons and teacher support. If you are in need of an affordable, accredited online high school program, Excel High School might just be the place for you! We are pleased to serve students throughout the Commonwealth of Virginia and the entire Country. For more information, call the school at (800) 620-3844. Excel High School is a Division of Excel Education Systems.